For our final advent offering, I thought I’d follow on from yesterday’s blog, where we looked at nativity images from around the world, with another contextual nativity scene that is flavoured with the artist’s own cultural location. This one has a special place in my heart, as it is a nativity with a bit of a Scottish flavour. It’s by Scots artist William Bell Scott and, when I was home in Edinburgh recently, I was fortunate enough to see it ‘in the flesh’ in the National Gallery of Scotland. Scott locates the nativity scene, not in Bethlehem, but in Penkill, Ayrshire, where he was staying at the time of this composition. Some of the traditional nativity iconography is present – they byre, the animals, the holy family, and the angels (who are sitting rather nonchalantly with the birds in the rafters of the byre). A procession of shepherds make their way towards a rather nervous looking Mary (Joseph meanwhile appears rather disinterested in events, his nose stuck in a book). You’ll see they are followed up at the rear by a piper playing the bagpipes, another wee dash of Scottishness added by Bell to this traditional nativity scene. In the distance, the magi make their decorous way towards the byre, It looks as though a a rather jolly celebration will soon be in full swing. And so we reach the end of our advent calendar for 2014. I do hope you’ve enjoyed it as much as we’ve enjoy doing it. From all of us in Theology at Auckland, we wish you and yours a happy festive time and hope to see you for more bloggings in 2015. It’s our penultimate advent offering today, so I thought I’d share a few more images than usual with you. On my search for nativity scenes in art, I’ve been struck by how different and yet how familiar all the different artistic renderings of this iconic image are. The artists’ personal styles, their geographical and historical context, and, sometimes, their personal spirituality all play a part in how they depict this Christian narrative. So, here’s a few images that have caught my eye – you can see which one you like best. First off, we have Dutch artist Jan Joest’s Adoration of the Christ Child (1515). I find this nativity scene very atmospheric (the sky outside the window is beautiful), but also a little bit eerie. 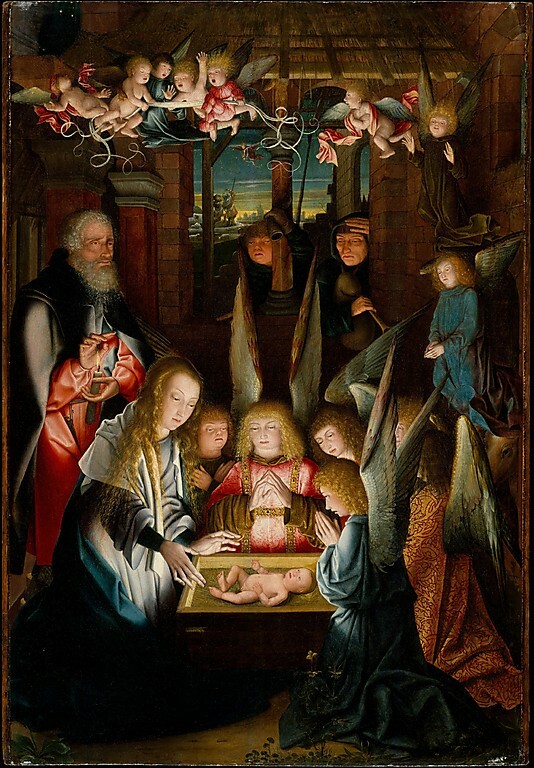 The figures (both human and angelic) stand around the tiny infant, their faces either in shadow or illuminated by a strange light that seems to emanate from the cradle. The two male figures at the rear of the painting just look plain sinister, while the angelic bodies hanging mid air like a tangled chandelier near the ceiling look a bit too unruly and at odds with the calm of the scene below. 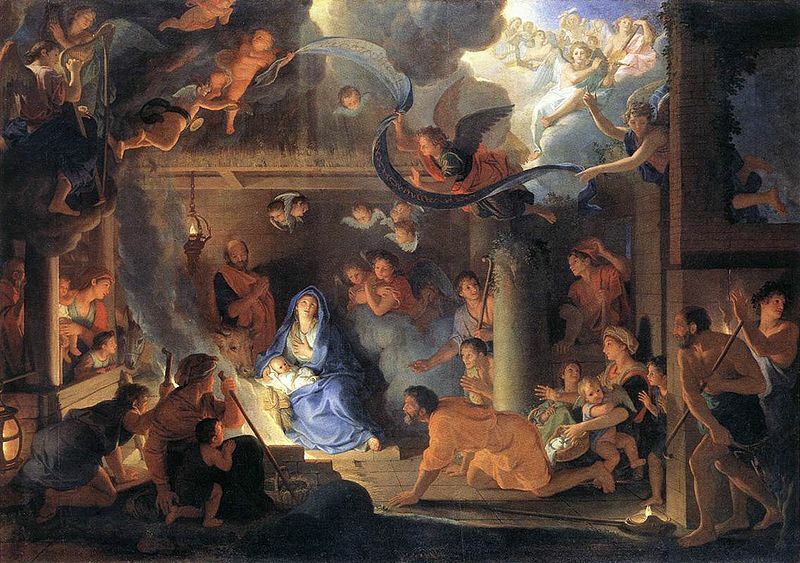 Next up, a beautiful Baroque image from French artist Charles Le Brun, titled Adoration of the Shepherds. This nativity scene positively bustles with movement and life – angels hover, swoop, and make music while the crowd below (a mixture of adults and infants) simply can’t sit still, but move excitedly around the mother and child who sit illuminated at the centre of the action. Only the infant Jesus seems to be motionless – a tiny oasis of calm amidst the restless delight that is carrying on around him. In total contrast, a lovely nativity by Moravian artist Adolf Hölzel, simply titled Adoration. Compared to Le Brun’s nativity, there is an intense stillness about this scene, the cool colours and quiet patience of the figures allowing the viewer to exhale and relax after our Baroque excitement. I particularly like the posture of Mary in this painting – the way she curls in towards her child, exuding a sense of maternal care and love. Moving beyond Europe, we can also enjoy other nativities that likewise take on the geographical and cultural locations of their artists. 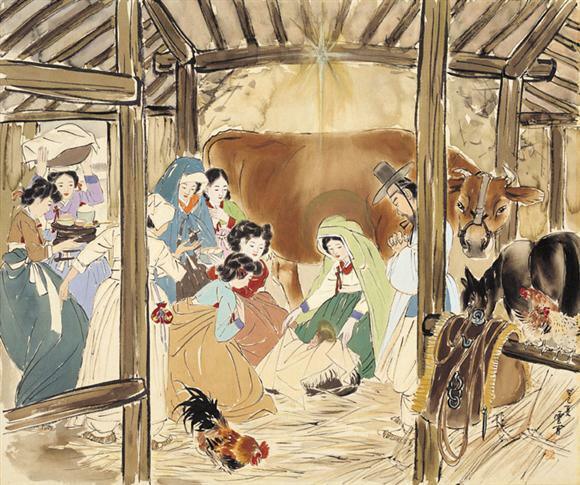 For example, in Korean artist Woonbo Kim Ki-chang’s work, The Birth of Jesus Christ, Mary is wearing a hanbok (a traditional Korean dress) while Joseph dons a Korean gat, or hat. 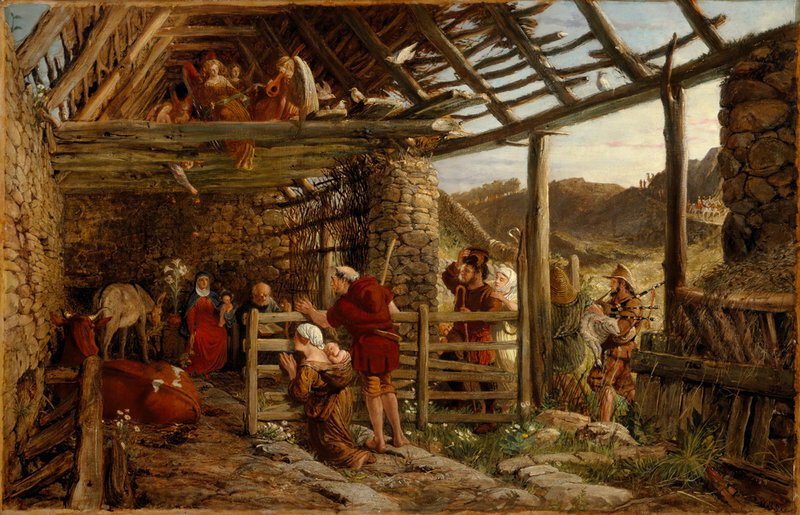 This painting is very similar to nativity scenes we often see in Western art (the byre, the farm animals, the onlookers), yet interestingly the characters that participate in the adoration are all female – some may be midwives perhaps, or women working on the farm where this byre is located. Here is a positively lovely artwork, by Chinese artist He-Qi – the multiple hues of blue are glorious and again, bring a sense of real peace to the nativity scene. Again, the traditional iconography of the nativity is here – the star, the angelic presence (I love this swooping angel who seems to be spreading a blessing over all present), the shepherds and the animals. Mary stands out in her pretty pink, while the infant Jesus is very fetching too, with his rosy cheeks and white and lilac striped swaddling. Gorgeous! 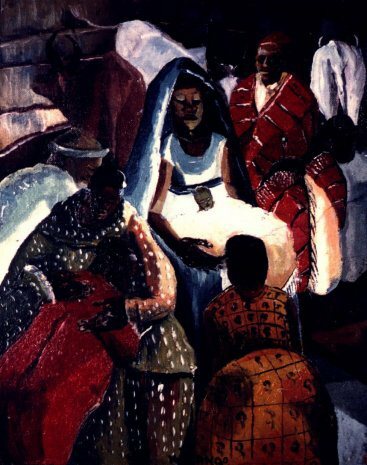 Another beautifully peaceful nativity is by Ugandan artist Francis Musango, and is titled Christ in the Manger. I love the wee baby’s head peeking out of the covers, resting on his mother’s lap. Various figures gather round Mary, but she has eyes only for her sleeping son. Her beautiful face is both serene and serious and those who look upon her seem a little in awe. Francis Musango, Christ in the Manger, n.d. 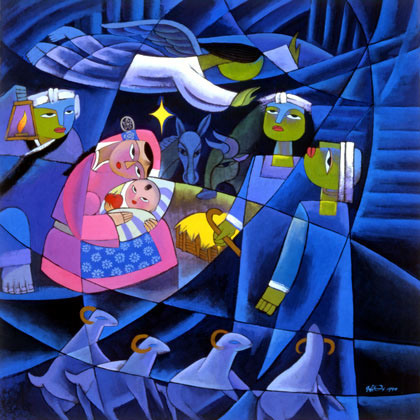 I also love this modern take on the nativity by US artist James B. Janknegt. It has a jazzy, party feel to it. The magi approach the door and are welcomed by a friendly cat – they all look intent on having a gay old time. They’re carrying some exciting looking gifts, including a teddy, a high chair, and flowers for mum. More practical, I guess, than gold, frankincense and myrrh? Meanwhile, poor Joseph’s consigned to the garden, doing a bit of hard labour himself, while Mary rests up in a comfy looking bed – I wonder if she’ll join the celebrations when these excited party-goers burst through the door? 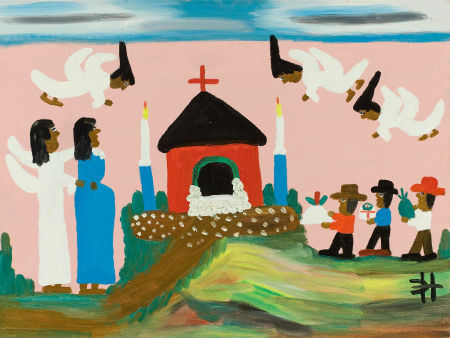 There’s also a fabulous air of anticipation and celebration in Louisiana-born African-American artist, Clementine Hunter. Joseph is nowhere in sight, but one of the angels is leading a very pregnant Mary towards the place where she will give birth, while the magi (in their stetsons) make their gift-laden way there too. The hovering angels look very excited about the coming events as they swoop through a candy pink sky, waiting to welcome their very special guests. 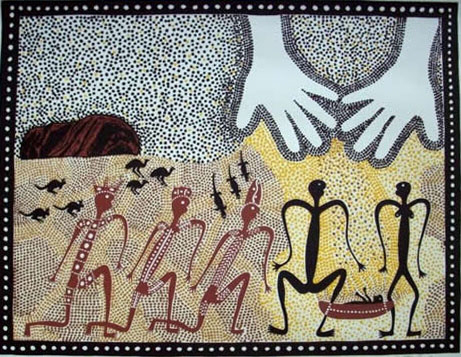 Australian artist Greg Weatherby uses indigenous iconography in his fabulous nativity scene, titled Dreamtime Birth. No angels this time, but a pair of what perhaps are divine hands, hovering protectively over the holy family, casting a golden light over them. The magi approach reverentially, while in the background, kangaroos, emus, and lizards make their way to pay homage too. 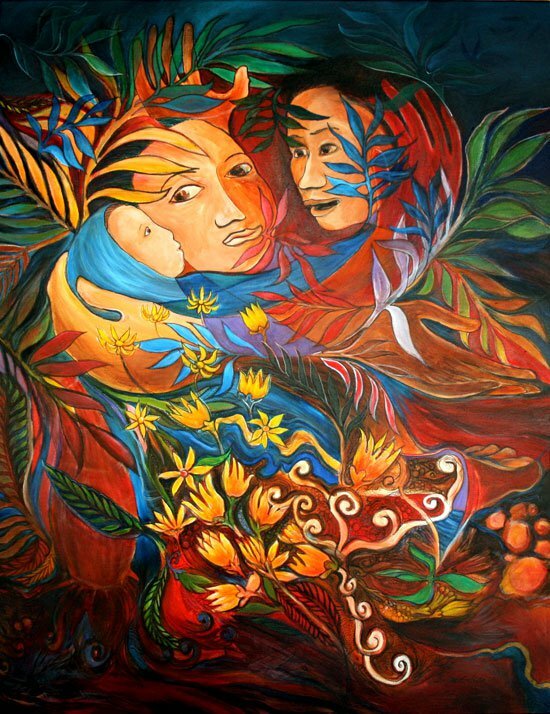 Finally, a very striking nativity image from Indonesian artist Erland Sibuea, who wraps (quite literally) the birth of Jesus in a glorious mantle of flora and fauna. Often, the natural world gets neglected in nativity scenes (with the exception of human and domestic animal life) – here, it becomes an intrinsic part of the event. All creation is celebrating this extraordinary cosmic event. Well, I hope you’ve enjoyed today’s global tour of nativities in art. I’m aware I’ve only scratched the surface, but if you are interested in finding more nativity scenes and images from around the world, check out these websites here and here. And I’ll see you tomorrow for our final advent offering. 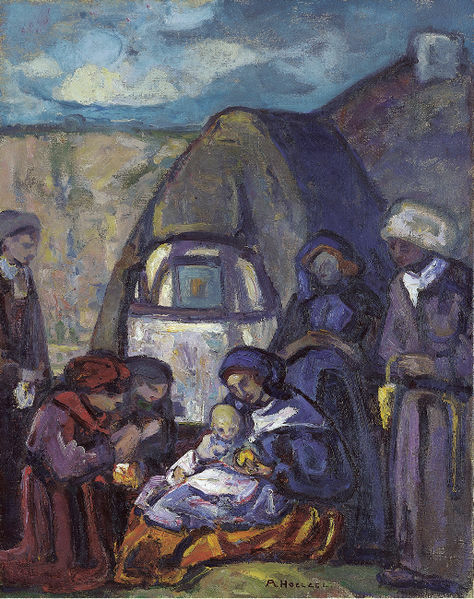 Today’s nativity scene is from a contemporary Utah artist Brian Kershisnik. The piece, titled simply Nativity, focuses on the heavenly response to Jesus’ birth, rather than the earthly. 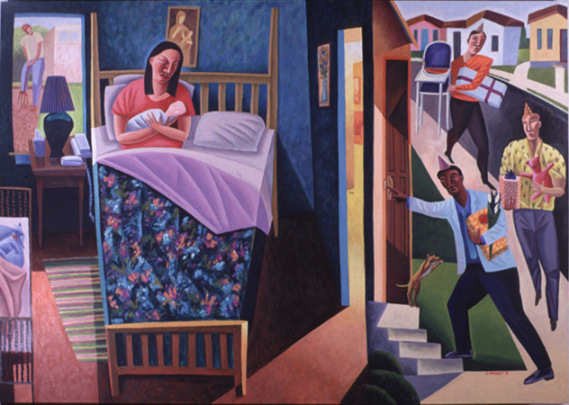 Jesus lies sleeping in his mother’s arms, his father sitting in the background seemingly overwhelmed by events (asking himself, ‘What have I gotten myself into?’ according to the artist). There are only a few other earthly onlookers in the painting – two midwives, a dog and her pups – rather than the usual plethora of shepherds, magi, oxen, cattle, and sheep we often see in traditional nativity scenes. Instead, Kershisnik pushes the earthly into a small corner of his canvas, cramming the rest of his space with a mob of angels, who crowd round and jostle to catch a glimpse of this extraordinary infant. Even child-angels are included in the multitude – it is as though this heavenly outing to see the first nativity scene really is a family event. To hear Brian Kershisnik talk about this piece, follow the link here.